Scott Melbye: "It’s a Very Exciting Time to be a US Uranium Producer"
Scott Melbye of Uranium Energy discusses uranium mining in the US, touching on projects, political support and market demand. Melbye had just returned from a visit to Washington with company CEO Amir Adnani, and he took the time to speak with the Investing News Network at the Sprott Natural Resource Symposium. In addition to discussing the future of nuclear energy in the US, he touched on the company’s projects. UEC’s core operations are in South Texas, and are centered on the Hobson processing plant, which can process 2 million pounds per year of uranium. UEC acquired the plant from Uranium One during the financial downturn, and the plant is located close to the firm’s five uranium deposits. One of those deposits is Burke Hollow, where UEC recently extended its drill campaign. A total of 94 holes have been drilled at Burke Hollow and an estimated 30 holes are planned. The firm’s latest acquisition is Reno Creek, which it purchased to advance its “footprint” in Wyoming. Speaking about the uranium market itself, Melbye said that operating in a bear market has “required a lot of patience.” However, he believes that the market hit bottom in November 2016, when prices reached about $17 per pound. As of July 24, prices were at $21.50. The transcript for this interview can be viewed below. INN: I was just wondering if you can tell me a little bit about Uranium Energy and how it got started. SM: Uranium Energy Corp is a company founded by Amir Adnani about 12 years ago now on the premise of looking at picking up undervalued assets in commodity downturns and derisking and preparing those assets for production when prices ultimately recover. The company, over the 12 years, has really grown the asset base but the real core of UEC continues to be in South Texas. We have the Hobson Plant, south of San Antonio. It’s 2 million pound a year plant that we acquired for probably around $10 million. It’s a $100 million plant we acquired from Uranium One during the financial downturn. That’s the core of the hub and the hub and spoke that we deploy in Texas. The spokes are the five deposits within 50 to 100 miles of the Hobson Plant so about 18 million lbs of resources. It’s a very simple business model. It’s ISR mining, environmentally-friendly, and low capital cost, low operating cost way to extract uranium from sandstone ore bodies. INN: I noticed the in-situ recovery. Can you talk a little bit about it? Scott: ISR has been around for a number of years and in fact, it was really developed in South Texas but I really see it as really a disruptive technology in that maybe similar to the way fracking unlocked a lot of uneconomic ore bodies. A lot of uranium deposits in the western United States either were mined by conventional means or were intended to be mined by those methods. Given the ore grades, they tended to be more high cost operations and so really suffered from competition from Saskatchewan, Canada, Kazakhstan and elsewhere. What’s happened with in-situ recoveries, we’re able to go back into these very same ore bodies and using this non-intrusive mining method to go in with again the very low capital cost, operating costs and be competitive on a world scale. In South Texas, we’re not a large producer but we have a 2 million lb a year capacity. We’d like to also advance our footprint in Wyoming. We just are closing on our latest acquisition called Reno Creek that for very minimal dilution, we’re able to increase our resource base dramatically and get a foothold now in one of the other most prolific uranium producing regions of the United States. INN: I noticed that. There’s a lot of uranium projects going forward in Wyoming. SM: Wyoming and Texas, uranium production in the United States is scattered amongst four or five states, Nebraska ,Wyoming, Utah, Colorado, Arizona, Texas but we really like Wyoming and we like Texas. One because the geology is great. They are the rural front sandstone deposits are extremely amenable to this ISR process. There’s great infrastructure, established roads, support facilities. You’re not out in the middle of the wilderness somewhere trying to put in all the infrastructure yourself. There’s plenty of workforce and talented skilled workforce coming from oil and gas and uranium mining and the regulatory process, which can always improve and I think is improving under the Trump administration but at least the regulatory process in Texas and Wyoming is somewhat predictable. It’s too long but it’s predictable and we see that really improving in the coming administration. INN: Uranium Energy had some recent news. On the 25th of July, there was 94 drill holes completed and the expansion of the Burke Hollow ISR project into September. SM: It’s an exciting story because a lot of the uranium deposits that companies are developing today are really deposits that were discovered in previous exploration cycles. Some going back into the 70s and 80s. But Burke Hollow represents a new discovery. Our company went into this 20,000 acre ranch and initiated our own drill programs and discovered the initial deposit, which extended about just under two miles of strike length. This drill program which was done very economically and very smartly in terms of spending that capital wisely. We’ve been able to extend that trend close to seven miles in strike length. For us, that’s going to be a very major producer. It is all essentially permitted. We have one last radioactive materials handling permit which is the most minor of permits to receive in the process and then we have three fully permitted projects in south Texas that can feed the Hobson Plant. INN: And so inevitably, the question comes down to the price market. Uranium prices have been low for some time now. What’s your thoughts on the future projections? SM: It’s required a lot of patience for those of us in the industry and uranium investors, the bear market that really started with Fukushima and has lasted now close to seven years. I think we saw the bottom of that cycle in November of last year where prices got down around $17 dollars a pound. We’re up at about $20 to $21 a pound today which is still very low and what’s important is that’s below the all in cost of most global production today. So any economist would look at that and say, this is an unsustainable situation. We would agree. The only reason we haven’t seen more recovery in the price to date even though we’ve had such poor uranium prices, you would normally see a lot more production cutbacks coming during a period like this but a lot of global production has really been protected by higher price contracts that were signed in previous cycles. What’s happening now though is these contracts are falling off. The producer has higher production costs that might be $50 or $60 or higher. They’re now looking at selling at $20 or $30 a pound and so the decision to cut back or shut in production, there’s no question. So that has really been the story in the last 18 months. We’ve seen about 17.5 million lbs of production cut backs. Everything from Cameco (TSX:CCO,NYSE:CCJ) in Saskatchewan, Canada, the United States, Niger in Central Africa. The Areva (OTCMKTS:ARVCF) mines have cut back 15 percent. Paladin at Langer Heinrich and then the big production cut that was announced by Kazakhstan, 10 percent cut to the world’s largest uranium producing country in January of this year. So that’s what needs to happen. I think there needs to be additional cuts that can and should occur to bring the market in balance but we’re going to see a situation where demand is increasing now at record levels in terms of new reactors coming online around the world and we’re going to have an industry that’s going to suffer from underinvestment and very long lead times to respond once prices recover. So as an investor, it’s a great investment thesis because I think we’re probably in for some very volatile upward movement in uranium price when that does start to occur. 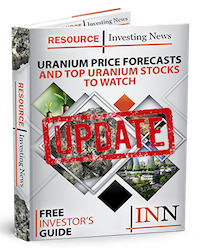 INN: And how has uranium energy been able to weather the challenges of this low price environment? SM: Well, our strategy as an unhedged producer has to be very different than a lot of our peers in that if we are not going out and hedging our sales forward because we intentionally do not want to cap the upside firm investors but the downside to that is when markets are tough as they have been, you have to have the discipline to shut in production and so we did that at the Palangana Mine in South Texas where we brought it into production. We had great results, technical and economic results of the mine but we had the discipline to shut it in and keep the pounds in the ground, which will sell into a better market going forward. Because we’re not in a full operating mode, we can really keep our cash expenditures at a very low level. Our operations as it is require a lot of contractor help so our staff and workforce can be kept at minimum levels and really the major cash burn that’s occurring in the company for us right now is just really at Burke Hollow with the permitting licensing process and the drilling program that we just discussed. Again, it’s watching the cost side of the equation, keeping your cash expenditures down, but continuing to advance and derisk the assets so they’re ready to produce and generate revenues very quickly when prices recover. INN: I’m pretty much out of questions. Is there anything else that you wanted to add that we didn’t touch on? SM: I think Amir Adnani and myself, we just returned from Washington DC where we met with the Trump administration, particularly the Secretary of Energy and the administrator of the EPA and I think it’s a very exciting time to be a US uranium producer like ourselves when we now have an administration that’s very pro-American, pro-energy security. They’re promoting a very diverse energy source. Nuclear is not just part of the mix in our energy policy going forward, it’s a priority so we were very encouraged by steps that EPA and DOE can take to promote both nuclear energy in the United States and support a strong domestic uranium mining industry. thks. for info. on uranium.